Welsh Open 2012: Ronnie O'Sullivan is set to clash with Judd Trump again in the quarter-finals, after winning his seventh consecutive ranking event match. The Rocket met the Welsh Potting Machine in the last 16 which he won 4-1. Ronnie made 125 and then Williams produced 133 in reply. Williams had to good chance to level 2-2 but missed a red with the rest while leading 49-23. 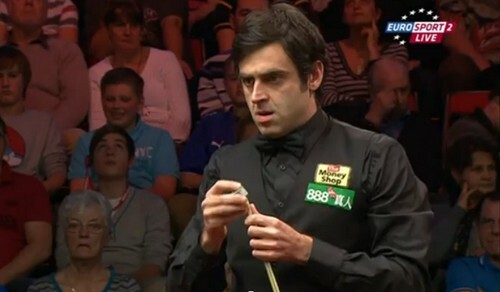 Ronnie added 56 to book his quarter-finals spot in the event. Another Welshman, Matthew Stevens lost to Stephen Maguire the finalist of German Masters early the month by 4-2. O'Sullivan had his top 16 spot secured to be seeded automatically at the Crucible, he said: "I wasn't worried (before Germany) about dropping out of the top 16. No one wants to drop out, but it would have been a challenge to have to qualify for the World Championship and I was looking forward to it in some respects. I never felt as if I should be ranked 17th or 18th and I had to be patient and wait for the form to come." Stephen Hendry who beaten Neil Robertson to make last 16 fell to Mark Allen by 4-0. The Northern Irish has not yet dropped a frame in the tournament, after a whitewash of Ken Doherty. Mark Allen will play Shaun Murphy who defeated Steve Davis the day before. Berlin semi-finalist Stephen Lee continued his good form, beating Tom Ford by 4-1 to make quarter-finals against Ding Junhui. Judd Trump had a comfortable win over Stuart Bingham in 42 minutes to earn a meeting with The Rocket. Bingham made a fine start with 74 before losing the following four which Trump had runs of 73, 73, 100 and 49 to win 4-1. 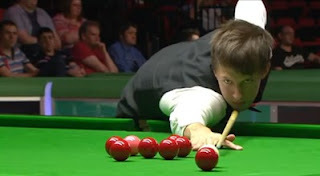 Judd Trump had an advantage over Ronnie as he won all their three meeting this season. World Number 1 Mark Selby saw off Martin Gould by 4-1 to complete the final eight line-up, playing Stephen Maguire in the quarters. The quarter-finals matches are best of 9 with intervals instead of the best of 7 in the first two rounds.